So according to journalists, Donald Trump’s proposed budget cuts are “big,” “deep,” “dramatic,” “massive,” and so on. With each breathless adjective — often coupled with excellent verbs like “gut” and “slash” — they add to the apocalypticism that’s engulfed the Left. “Reading through the Trump budget,” tweeted The New York Times’ Nicholas Kristof, “I feel as the Romans must have felt in 456 AD as the barbarians conquered and ushered in the dark ages.” Vox claimed that the budget plan is a proposal to “dramatically remake the federal government.” If only. In perspective, all of this melodrama is over probably less than 1 percent of the national budget. As Nick Gillespie points out at Reason, federal spending is at historic high in both absolute terms and as a percentage of gross domestic product, with outlays at more than 20 percent, higher than the post-war average. Until there is entitlement reform — which, right now, seem like never — the only place to trim is within the confines of discretionary spending. 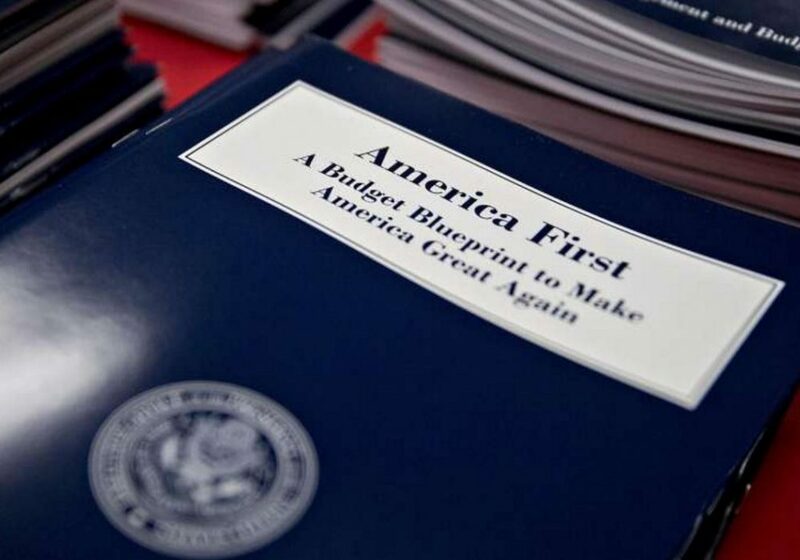 While the White House’s budget blueprint, unsurprisingly titled “America First: A Budget Blueprint to Make America Great Again,” contains some sound fiscal conservative cuts, it’s not a free-market budget because Donald Trump is not a fiscal conservative. The blueprint, in fact, is less of a budgeting document than a plan to begin rolling back some of the worst excesses of the bureaucratic state. Maybe that’s just as good right now. Compared to actual 2017 appropriations, Trump’s 2018 budget reduces discretionary budget authority by a whopping…$13.6 billion, or 1.2%. Under Trump’s budget, the Education Department would see a 14 percent cut, which, for those who believe the federal government should have no role in local education, is around 86 percent too little. The good news is that $1.4 billion will be re-allocated to encourage local charter schools, private schools, and school-choice initiatives that will help minority and low-income children escape from failing schools. This might be the best “investment” the DOE has ever made for poor kids. The budget would cut federal funding to the Corporation for Public Broadcasting. There are numerous ideological reasons to oppose the state’s funding of arts, but the truth is that PBS gets only around 15 percent of its budget from the government; NPR gets 2 percent, though it might be more because it’s difficult to tell due to opaque budgeting. Surely, concerned lovers of snooty British television will help make up for this difference in fundraising. It should be noted that the budget proposes to eliminate funding for 18 other agencies, including the Woodrow Wilson International Center for Scholars and U.S. Institute of Peace. It also proposes to cut some of the payments to the authoritarian-infested United Nation via reductions in their climate change programs and “peacekeeping” efforts. … reflects the success of environmental protection efforts, a focus on core legal requirements, the important role of the states in implementing the nation’s environmental laws, and the president’s priority to ease the burden of unnecessary federal regulations that impose significant costs for workers and consumers without justifiable environmental benefits. The Obama administration used the EPA as extraconstitutional branch of government, enacting policies that were either rejected by Congress or never brought to it in the first place. If you want government to control energy markets, cut deals with foreign nations to artificially shrink the American economy, and erect sham “markets” to trade air, elect congressmen and senators who will do it. There are small cuts elsewhere, mostly in places where there are surely ways to streamline and better utilize funding. Veterans Affairs, the Defense Department, and Homeland Security all get bumps in funding, the latter with around $4 billion for the Mexican border wall. The State Department would see a cut of $54 billion, which has led Sen. Lindsey Graham to declare it DOA. The notion that the final budget will look anything like the blueprint is remote. Then again, most of the budget reflects mainstream Republican positions since 2009, at least. Outside the State Department cut, I’m unsure what reasons GOPers would have for not supporting the reductions. I’m certain they’ll come up with something.